I read somewhere that we send a message at least ten times a day that our toddler’s emotions are not okay with us. Whether it be offering a cookie when they get upset or asking them to be quiet or relax. Once I started thinking about it I realized I do it all the time. I made a commitment to notice and try to allow my toddler to feel his full range of emotions, no matter how uncomfortable for me! Read on to see how I do it. 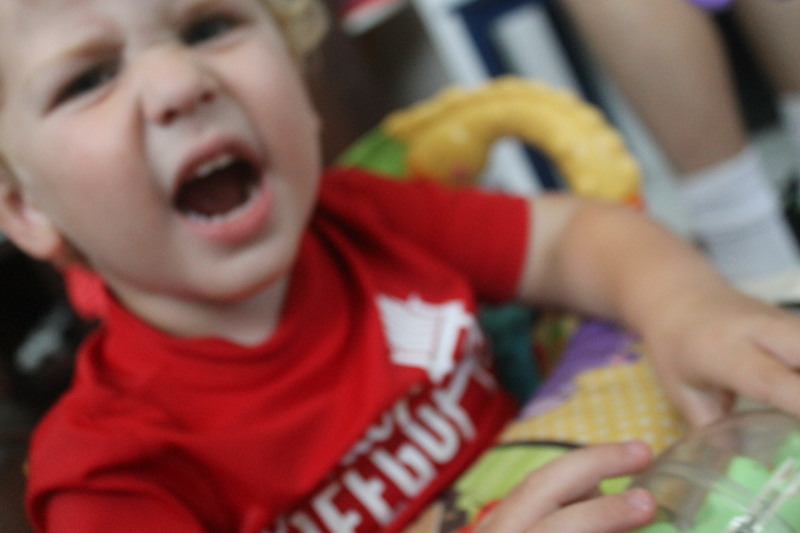 First, let me explain what my toddler’s tantrums look like. They come on mostly when it’s time to go to bed although can be triggered by just about anything when he’s tired. He will kick, scream at the top of his lungs, bite, hit, cry, flop his whole body, and just be completely beyond reasoning with. If we try to carry him he will kick, hit or bite us and sometimes the body flop would mean a pretty serious head bonk to the nose or mouth. I have had a lot of dental work and, believe me, I was protecting my teeth! He’s pretty young so reasoning is just starting to work and it’s not that reliable. I use it when I can. Many articles I read told me to give him choices, well that would just rile him up more. I would say, “Which pajamas would you like to put on, these or these?” His response: “NOOOOOO!!! !” What exactly was I supposed to do then? Consistent Routine: We would go through our normal bedtime routine (which almost backfires now because then he knows what’s coming and starts to get upset). This starts with an episode or two of Curious George. Propose something that allows him to get something rather than give it up. I would ask him to pick a toy to take to the bedroom with him and let him bring anything he wanted. It gave him a good reason to get up and into action, gave him something to look forward to, and made him feel like he was getting something rather than giving in to my demands. Respond to actions with unruffled statements: If he screamed I would say “You are screaming.” If he cried I would say “You are crying”. Stop hits, kicks and bites if possible. I would hold his arm and say “I can’t let you hit me, we don’t hit our friends and family.” Same with kicking and biting. Sometimes I wouldn’t be able to stop him in time but I wouldn’t yell at him, I would just repeat the statement above and try to be ready for the next one. These are all simple, unruffled, somewhat detached statements. I would just keep repeating this process. Eventually he would comply, sometimes it took a while. I would just be patient and wait it out. I am showing him that his emotions don’t scare me or upset me, and showing that I am hearing what he is trying to communicate. Once we got into the room he would usually start playing and I would just start reading books one after the other. I would choose somewhat long ones so I could just sit and read while he played and got used to the idea of going to bed. Eventually I would tell him that I was going to get his dad to come in and say goodnight. If I hadn’t gotten the PJs on yet, dad would be able to do that, read him a story and/or rock him and sing a song and then put him down in bed. A few times dad had to lay down beside the bed until he fell asleep. By the time dad came in, he was all prepped and ready for bedtime so that part usually went pretty smoothly. This took probably 5-6 nights and the tantrums started to diminish. I will say that I was able to be patient and repeat the phrases above better than my husband could. Whoever can handle it best should do it, I think. What worked for us was that my son preferred my husband take him to bed (he had been doing it for a long time since I had baby number two). I wanted to get back involved with bedtime but my son just wanted his dad. So by me taking the reins, I was able to get more bonding time with him, help him handle his emotions and then use his desire for his dad to clinch bedtime. Now I use this tactic for all tantrums and it seems to shorten them dramatically. What they really want and need is our love. I always end a tantrum encounter with a huge hug and smile so that he knows I love him no matter how big his emotions get. I want him to know I will not hold it against him. This process has brought the two of us closer and I am really enjoying the fruits of my labor. My whole goal is to teach them emotional maturity and this strategy goes a long way toward doing that. It’s a cross-section of allowing him to be independent while also doing what I want him to do. I’d love to hear what works for others and, if you try this, did it work for you? Tomorrow I will share my best parenting tip!